Choosing new internal doors needs as much care as picking out furniture. So, what to go for? According to a recent article on Ideal Home available at Guide to internal doors, doors can create just as much of an impression as a costly piece of furniture. They are touched and seen close up every day, so don’t just go for the cheapest replacements – try to match the style to the rest of your home’s features as much as possible. Wood is the natural choice – every piece is exclusive and helps to give your home its own character. Every wood has its own characteristics and you will not find another timber that can match its elegance and charisma. Other materials have tried to give the impression of a wood finish, but none have been able to capture the texture, depth, warmth and beauty of the real thing. 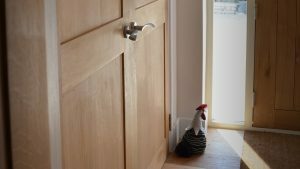 At Shaker Doors we only use the finest materials, Oak, Maple, Tulipwood and Walnut. From the photo above, you can see our Oak 2 Panel Shaker Doors with chunky stainless steel handles, that have been rebated to become a pair. A glimpse of external door is one of our oak external door. If adding modern touches to a home is what you are looking to do then adding glass doors to your bathroom, bedroom, kitchen, and other areas would be the best option to go with. We strongly feel that glass doors will add light to a room and help to make it look bigger. These doors are perfect for adding to a contemporary style design and will add a contemporary appearance to other styles of interior decor. So, if you are looking to add class and style into a room, glazed doors would be the perfect element to add. In summary, doors are among the most important features of a home and have practical and aesthetic uses both on the exterior and the interior. And visit our door shop!! We have a wide range of internal and external Shaker doors, all handcrafted in our Oxfordshire workshop.